It's the perfect day to o celebrate this iconic food. May 10 is National Shrimp Day, and it's a perfect time to celebrate the iconic food that so many of us tend to gravitate to at the all-you-can-eat buffet. Shrimp is the most popular seafood choice but, surprisingly, even though we fill our plates with shrimp cocktail and happily dip shrimp after shrimp into that spicy red sauce, experts agree that Americans don't include enough seafood in their diets. The U.S. Department of Agriculture recommends two servings -- just eight ounces -- of seafood per week, backed up by findings from the American Heart Association which confirm the benefits of seafood in reducing the risk of heart disease. "Stars of the sea, such as shrimp, are loaded with healthy nutrients like lean protein, B vitamins, iron and omega-3s, but not with calories and fat," said Judy Dashiell of the National Fisheries Institute/The Shrimp Council. "Studies have shown that omega-3s, which your body can not make on its own, help keep brains and hearts healthy throughout a person's life." The Harvard School of Public Health agrees, pointing out that the omega-3s found in seafood lower blood pressure and heart rate, improve blood vessel function and, at higher doses, lower triglycerides and may ease inflammation. Despite all of these benefits, though, the average American eats just 15 pounds of fish annually, compared to about 70 pounds of red meat and 70 pounds of poultry. So how do you get your recommended weekly allowance? Simple. Just toss some shrimp into your salad, pasta or soup or casserole. Here's a simple recipe which pairs shrimp with spinach -- a nutrient-packed superfood in its own right. I've tested it myself, and it's delicious and a great choice for summer entertaining. Note: If you're wary of cooking your own shrimp, try some of the frozen selections from SeaPak. Use their Popcorn Shrimp to fill Fiesta Shrimp Tacos, and don't skimp on the shrimp! Toss shrimp with 1/4 cup salad dressing (save other 1/4 cup); cover and refrigerate shrimp at least 30 minutes, then drain. Thread shrimp onto skewers. Grill shrimp, covered, 4-6 inches above white-hot coals for about 4 minutes or until pink and done. 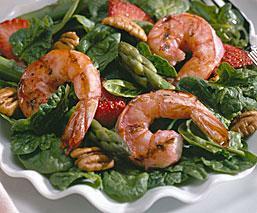 Remove shrimp from skewers and place in a large salad bowl. Add remaining ingredients and toss with remaining 1/4 cup salad dressing. Serve at once.